IPS offers a large variety of pumps to suite your every need. Integrated Process Solutions became involved in pumps from the start to provide one of the 3 major parts of a fluid control system. Most systems require a pump such as centrifugal pump, a positive displacement pump, a magnetic drive pump, or a chemical injection pump. We offer many styles of technology but most of what we provide falls under the centrifugal technology. Within centrifugal pumps, we have standard cast iron pumps, stainless steel pumps, 3A sanitary centrifugal pumps, and multistage centrifugal booster pumps. For chemical transfer we typically specify a magnetic drive or referred to as mag drive pump. 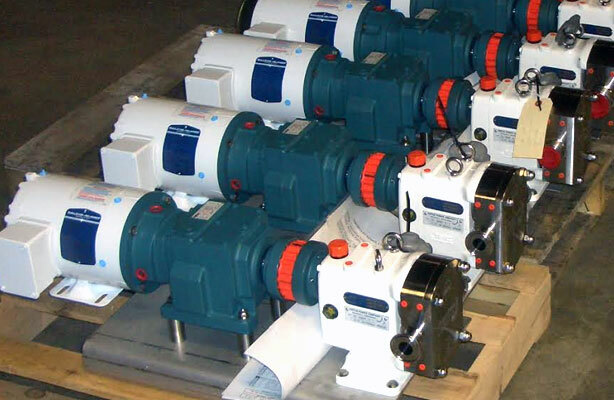 The mag drive centrifugal pump uses a set of magnets to drive the motor force through a thin wall to the liquid side. This results in a sealess style pump and provides longevity for moving chemicals or other harsh fluids that typically damage seals. The magnetic centrifugal pump can come in stainless steel and a variety of plastic pump housings. Most centrifugal pumps can also be offered with explosion proof motors and NSF ratings for drinking water to NSF 61 codes. To round off our pump offering, we also supply double diaphragm pumps, peristatic hose pumps, and chemical injection pumps.